Who knows what evil lurks in the hearts of men? 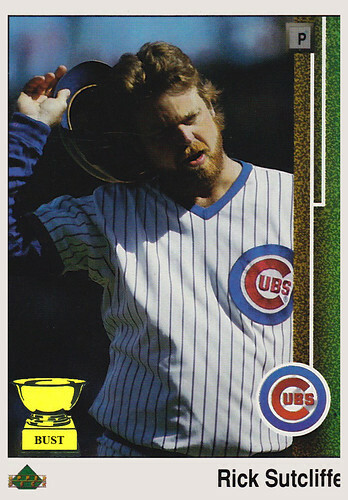 Rick Sutcliffe was an ace and former Cy Young winner with many hobbies and occupations. But that didn't stop him from becoming a crime-fighting vigilante with psychic powers. Sutcliffe moonlighted as "The Shadow," a hero who influenced the minds of evildoers by making them see a few feet to the right or left of where he stood. When an opponent would fire a bullet or swing for the fences, The Shadow would let out his trademark laugh as the guns and bats fell silent. From where did these powers emerge? Was Sutcliffe born with this gift of mind control? Did he learn it from a sorcerer, warlock or hand-puppet master? The answer to all these questions, The Shadow knows, is no. The Shadow's powers came from the perfect fusion of two omnipotent sources: the feathered mullet and scraggly beard.